This is a web blog that provides information and show’s how to solidify and remove crude and bunker oil from land and sea using wax. In 1969 Mr. Nelson discovered that wax and oil have such an affinity, that the wax could be used to subdue the oil upon contact. This would allow for the solid wax/oil to be removed by fisherman before it reaches the shore. 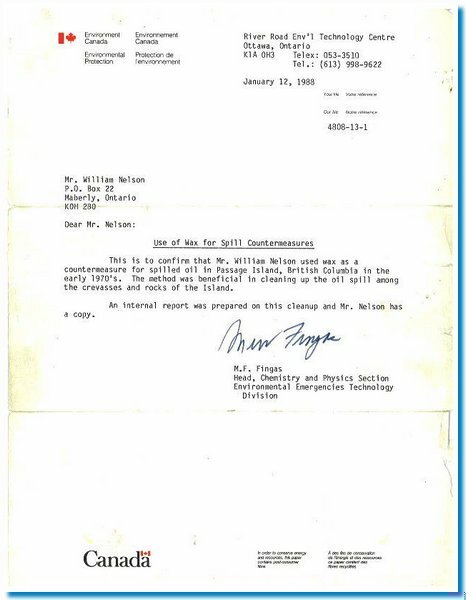 This removal process was first demonstrated for Environment Canada under contract in 1974 on the Passage Island oil spill. (a bird sanctuary, in British Columbia) The Process was also demonstrated to the US and Canadian Coast Guards. See documents on this blog for details on other demonstrations. All the waxes for these demonstrations were supplied and formulated by THE INTERNATIONAL GROUP, INC. (IGI), originally known as INTERNATIONAL WAXES LIMITED. has been researching the use of waxes for solving Environmental problem's for the past 40 year's and has no plans of quitting any time to soon. has been researching the use of waxes for solving Environmental problem's for the past 42 year' ,I enjoy sharing my discoveries with anyone in my field of research. PERTH - Perth wax researcher Willy Nelson has arrived in Louisiana to offer advice on the Deepwater Horizon oil spill cleanup, but so far, he hasn’t been able to access the oil-tainted water. Nelson and Louisiana businessman Kirk Bergeron, who is sponsoring Nelson’s trip, intended to fly over the affected areas to look for a spot where they could access the water to get oil samples to test. Nelson uses granulated wax to soak up oil into a solid that can be skimmed off water. International Group – IGI Wax delivered donations of wax supplies to Louisiana for him to use, Nelson said. Bergeron took an interest in Nelson’s 40 years of wax research, some of which is posted on his website, www.waxforpollution.com, and decided to fly Nelson to the Gulf Coast to see if his demonstrations could attract the attention of government and BP officials. The trip was initially delayed because Bergeron was going to send him samples of oil mixed with oil dispersant that is being used to break up the slick; however, parish governments (similar to counties in Ontario) have begun to put pressure on BP as oil approaches marshes. The parishes announced they were seeking ideas from the public, with a quickly approaching deadline. “They were frustrated and said ‘To hell with you. We’re not going to wait on you – we’ll do it ourselves,’” Bergeron said. So far, Bergeron and Nelson haven’t co-ordinated their efforts with local officials, but Nelson was confident that garnering attention through wax demonstrations on local TV channels will make the people in charge of the cleanup sit up and take notice. Nelson said he doesn’t intend to return to Canada until he has shown people what his wax can do.